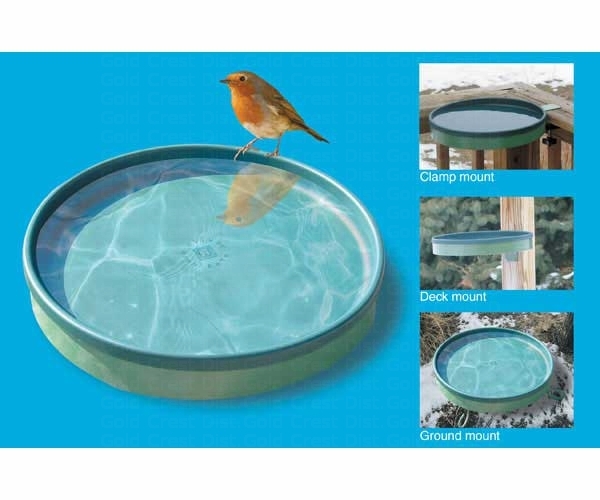 Are You Looking For the Best Performing Heated Birdbath? Allows for three different mounting and display options. You can mount it to a 4x4 deck or fence post, clamp it to the top rail of a deck, or simply place it on the ground. It features a built-in 75 watt heater with more power which is thermostatically controlled to work automatically to keep water from freezing during the winter. The unit has been tested in sub zero temperatures and performs great. It has a shallow design that birds like. It can be used year round as the cord tucks neatly away under the unit during Spring and Summer. One year warranty from manufacturer. This model replaces Farm Innovators 14 " Heated Bird Bath with Screw Mount Bracket and Clamp Bracket. Note: This is a replacement for earlier models from Farm innovators that combines features of the FIGBD60, 70, 80.